I love this stibnite pendant, but because it is a toxic stone, I only wear it when I have fabric between it an my body. Stibnite is a true crystal for our time. 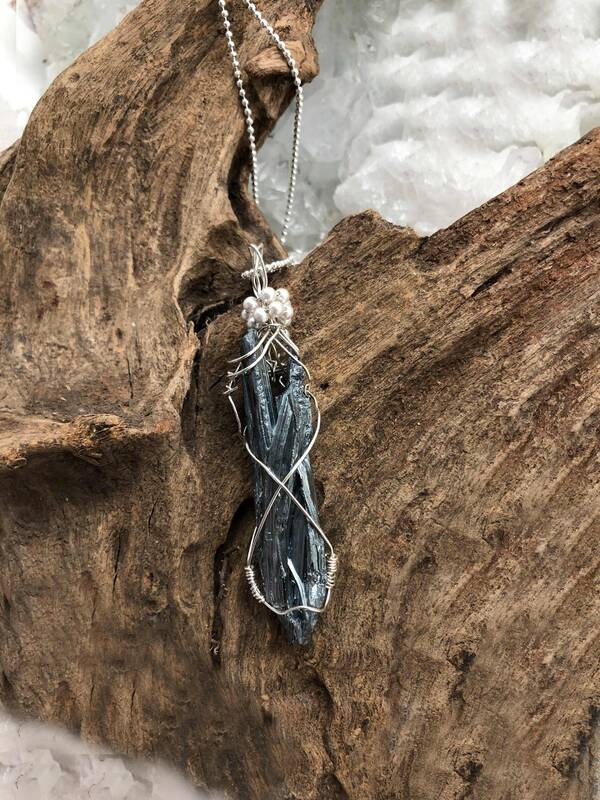 Stibnite assists in helping to adjust to the constant changes that are faced on a daily basis. It alleviates fears, difficulties and chaos. Stibnite can help to stabilize one’s economy, making it a perfect piece to use in intention ceremonies and/or meditations. Stibnite also aids in the various energy shifts and higher frequency energies that our bodies are currently undergoing. It will help to counter the physical symptoms of these shifts. 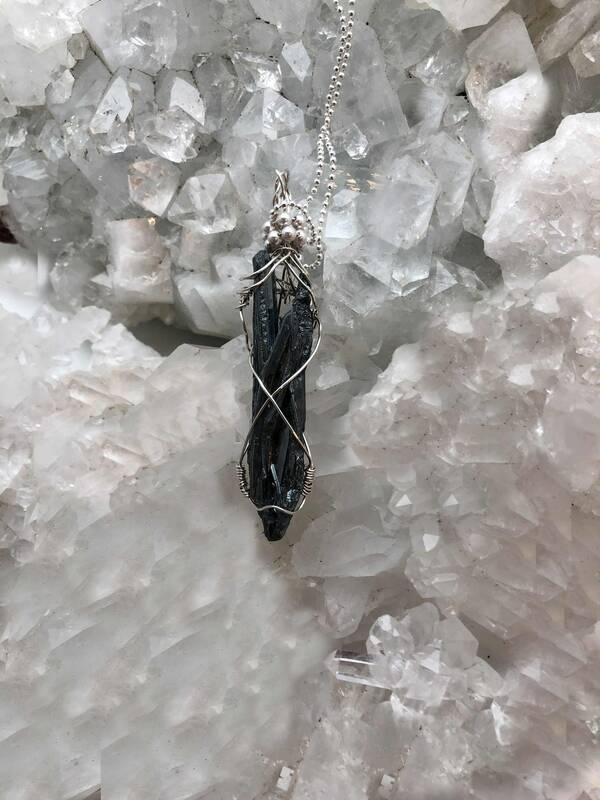 For those who are sensitive to energy in general, using Stibnite can form an energy barrier around the body, enhancing your own energy field and keeping others energies at bay. Stibnite can be used as a diagnostic tool for healing. 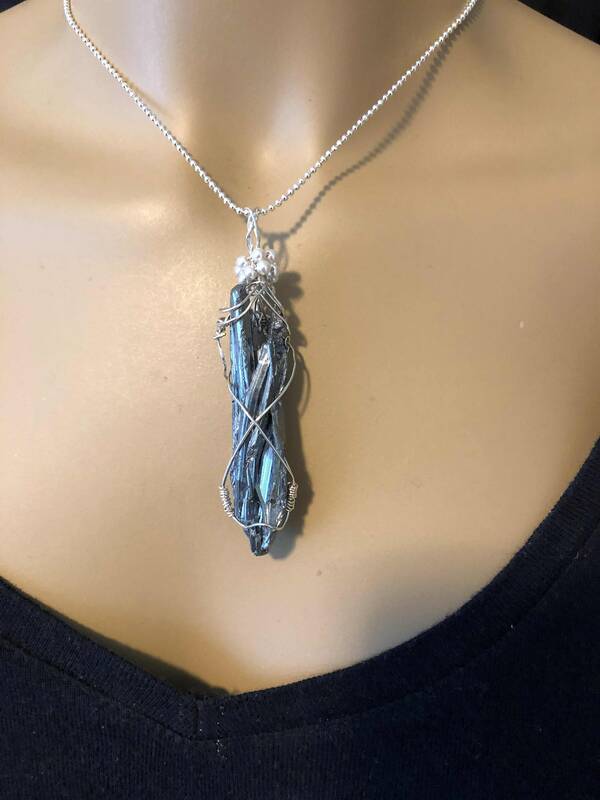 The energy of Stibnite allows a deep awareness of the physical body, which will help when scanning the internal body for specific areas where disease may be present. Stibnite will also promote cleansing and release toxins from the emotional body. Use Stibnite to enhance meditations (centers, promotes inner stillness), astral traveling experiences (keeps one spiritually open while remaining present and aware) and allow a higher understanding and ability to communicate with the animal, plant and mineral kingdoms. Stibnite can assist in the healing of infection sites, stomach and esophageal disorders, and muscle tensions. Caution: Because Stibnite is toxic, it should not be used in elixirs, or near pets/children. Wash hands thoroughly after use.